Mavic USA, is 90% owned by Mavic France, 10% is owned by an American. Mavic France is now owned by the publicly traded in France, Saloman Group, which bought Mavic SA for about $17.5 million USD. Mavic USA, as a kind of autonomous American subsidiary, the importation and sale of Mountain bike parts has been largely curtailed for the 1994 season and beyond. Mavic USA is waiting for the French engineering group to come up with something startling and new, which will probably have a 58mm/94mm bolt pattern. 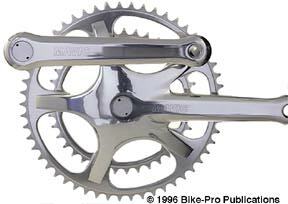 These cranks, however, were a good item though cracking at the spider sometimes occurred. This review is to be considered informational only, because we don't think Mavic USA can be enticed to get Mavic France to make more of them. The arms are forged of 2014 aluminum alloy, then numerically control machined, milling them to close and precise tolerances, and finally hand polished. The left arm after forging is machined to the approximate shape and then milled to create the flat surfaces, as well as the initial rounded contours on the arm. The arm is drilled, broached, and tapped for the pedal and crank bolt assembly. All of the front surfaces of the arm are then high polished to remove any trace of the previous milling work. The final step is the etching of the "MAVIC" name on the front of the arm. The right arm is made similarly, forged of aluminum, machined into it's final shape, then high polished on the front and engraved with the "MAVIC" name. The arms are 32mm wide at the pedal spindle, narrow slightly over the pedal, then gradually widens to 30mm. The left arm at the B/B spindle is 39.5mm wide and cone shaped with a flat bottom. Both arms have a thickness of 11.9mm at the pedal spindle that becomes 13mm near the B/B. The spider, (holding the chainrings to the crank arm) is a heftypiece of mill work, that is deeply seated around the bottom bracket shell for a close fit, to achieve a low "Q" factor. The spider encloses the B/B shell to help prevent the chain from shifting off the inner chainring and jamming between the chainring and the B/B spindle. In addition, the "Q" factor is reduced by having the arms built parallel to the line of travel on the bike. They do not splay out at any angle. They are straight. Mavic believes that all crank arms should be straight so that if you are in a wreck, you can quickly sight down the end of the arm and notice immediately if it's bent. Crank arm problems, should they ever occur, are highly noticeable also because the arm is left un-painted. The Mavic 637 crankset comes with three hard anodized, round chainrings, using the standard 74mm and 110mm bolt pattern, that have been precision cut and then ground for a precise chain fit. The inner chainring has fifteen machined holes that give the chainring a slight ellipse. This "offset" element permits you to adjust the cranks to avoid rear wheel skid. The 637 set also comes with a pair of crank arm dust caps machined from aluminum rod then Grey anodized. The cranks, chainrings and crank arm caps are made of aluminum. 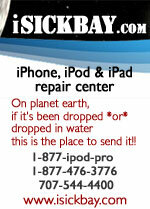 The fixing bolts, inner and outer are made of steel. The arms are a highly polished, un- anodized Silver color. These cranks will work with any 2 degree, tapered spindle, bottom bracket, (Mavic prefers theirs, which is a good choice if your B/B shell has stripped threads). 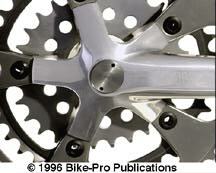 The cranks are made in 170mm, 175mm, or 180mm lengths with the 26-36- 46 or 28-38-48 tooth chainrings. Mavic 637 cranks come as right arm, with spider, three chainrings, all the required fixing bolts, left arm and a set of machined aluminum crank arm caps. The 170mm crankset, with all included parts, weighs 689 grams. These aren't made any longer and are no longer available. Mavic continues to make a Road racing crank set, and wisely uses the 130mm bolt center diameter chainring pattern. The arms are like the 637 set forged of 2014 aluminum alloy with Numeric Controlled milling machine work to make the arms perfect in shape. They are also straight so sighting down the end will reveal any bends. The arms are 33.75mm wide at the pedal spindle, and narrows to 25.08mm slightly above the pedal. The left arm widens to 33mm just below the B/B spindle and is 41.22mm at the center of the B/B spindle. The right arm has an expansive manta ray shaped spider made then machined with the right. The spider has a thickness of 5mm over most of its area, but becomes thicker at the spider arm ends. The 631 cranks don't use a conventional outer fixing bolt set, instead it uses 4mm long aluminum spacer between the inner and outer chainrings. A Black steel fixing bolt passes through the inner chainring, then spacer, then outer chainring and anchors into the back of the spider arm. The outer chainring has an anti-jam pin. 631 cranks come with machined from aluminum rod crank arm caps, left in an un-anodized Silver. These cranks will work with any 2 degree, tapered spindle, bottom bracket, (Mavic prefers theirs). 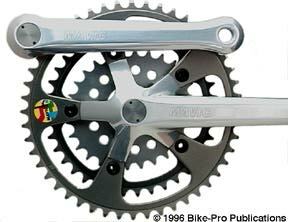 The cranks are made in 165mm, 170mm, 172.5mm, 175mm, 177.5mm, or 180mm lengths with 39-53 tooth chainrings. We found the Mavic 631 crankset has a Bike-Pro Q measurement of 134mm. Mavic 631 cranks come as right arm, with spider, two chainrings, the required fixing bolts, left arm and a set of machined aluminum crank arm caps. The 172.5mm crankset, with all included parts, weighs 722.5 grams, the 175mm set weighs 727 grams.